2001. Acrylic on stretched canvas. 24"x30". In the mythology of the ancient Greeks, Sagittarius was a warlike centaur armed with a bow. 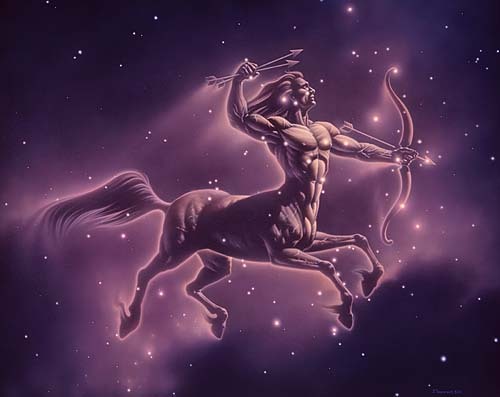 Although the centaur is mythical, the major stars of the constellation Sagittarius have been depicted in their proper positions and brightnesses. The familiar "teapot" asterism can be found in the torso, left arm and bow of the figure.